Discussion in 'Help Tickets' started by xXSaltyManXx, 6 February 2019. When the fishing contest goes on, anyone who participates gets nothing. You get the fish, but no one gets any rewards. now the /fish top record has been reset and you can't use that command etc during a contest. Like before. Problem now is that no one catches any special fish during the contest.. so no one wins. 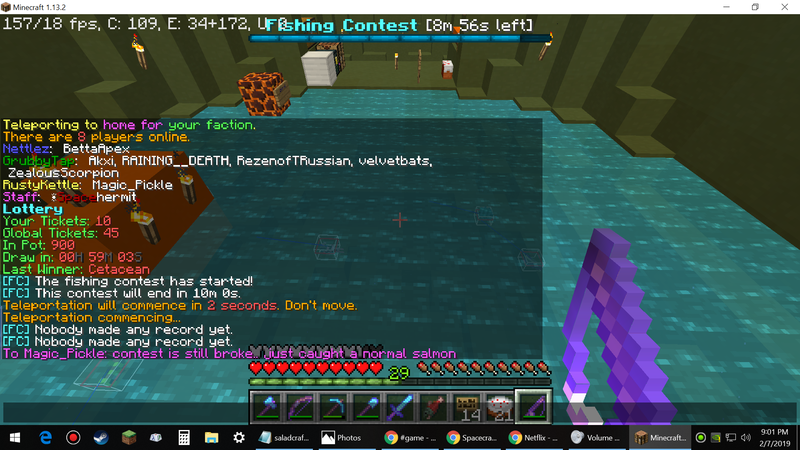 When typing /fish rewards the command says i do not have permission and does not show the reward that can be gotten from fishing. Also /fish shop [player] does not work either and says i have no permission. Also if it was possible, i would like to know/have a command that tells me the chances of getting certain fish and if the quality of the rod changes these chances.